Chief executive Philip Clarke’s ruthless dispatch of his number two, Tim Mason, is a final reminder – if any were needed – that the past is another country, so far as Tesco is concerned. They did things differently there; they will never do them the same again. Eventually, someone had to pay the price for Tesco’s enormous strategic folly in setting up – from scratch – the ironically-named Fresh & Easy retail venture in California. One thousand stores were promised in 2006, when the initiative was hatched; 200 have actually opened and nothing but a £1bn loss has been banked. By rights, the faulty judgement was Sir Terry Leahy’s (as he himself has admitted). But Leahy has long since departed as chief executive; while Mason fronted it and is still very much in the public eye. Mason offered to conduct the strategic review into Tesco’s US operation himself, but Clarke needed a scapegoat and declined the offer. Mason had to go. Arguably, however, Mason set himself up for a fall with his own poor judgement call in 2006. He should never have allowed Leahy to prevail upon him to undertake mission impossible in the first place. The USA – even in the heady early noughties – was widely perceived to be a graveyard for aspirant UK retail brands. Marks & Spencer, Sainsbury and several others had broken their back on the same reef – and paid the price in years of dysfunction. But Tesco, at the time, was in the grip of advanced corporate hubris: as the head of world’s most successful retailer, Leahy was convinced he would be the one to buck the trend. And who better to lead the vanguard than his most trusted lieutenant, Mason? Mason and Leahy were the dynamic duo at the heart of Britain’s most successful retail story. Leahy was the sharp business brain, and Mason the marketing man with an uncanny, intuitive feel for what the customer wanted. Together they had not only assured Tesco’s dominance in the UK retail market, but put an unchallengeable distance between Tesco and all its competitors – encapsulated in a single, extraordinary, statistic: By 2005 £1 in every £8 spent in Britain’s shops went to Tesco. The feverish back-story to all this success was more disquieting. What would happen, in the not-too-distant future, when Leahy retired? Leahy clearly supposed that Mason could make the leap from marketing to corporate leadership that he himself had so effortlessly executed. Mason, who joined Tesco in 1982 and had headed marketing since 1997, was desperate to prove him right, and eagerly clutched the poisoned chalice of Fresh & Easy. The transition fatally upset the balance of power at Tesco. Mason may have had his fair share of bad luck in California, but his operations skills were clearly inferior to those of Leahy. With the result that, as US losses inexorably mounted, he was passed over when the succession issue finally came to the fore. Not only that. Mason’s marketing nous was sorely missed back home, just when Tesco’s UK operation most needed it. When Mason – then group marketing chief – decamped to America, he took with him his head of UK marketing Simon Uwins. Their UK successors lacked finesse. High turnover of subsequent personnel did not help. But something other than stability was missing – that old Tesco marketing magic. Marketing became too formulaic, and too sales-obsessed. While Tesco struggled to find a new compass-bearing in post-recession Britain, it let its competition off the back foot. Asda, Sainsbury’s and Safeway (now recast as Morrisons) began to catch up. The Tesco offer, by contrast, began to look tired and over-extended (particularly in non-groceries). The retail behemoth was engaged on too many fronts at once and it showed – in declining profits and advertising campaigns that lacked the common touch. Would this have happened if Mason had actually been chief marketing officer in more than name? That’s the thing about subjunctive history – we will never know. An easier lesson to draw from the Mason story is one about symbiotic work relationships. Corporate success is rarely the product of a unique talent. Would Mason and Leahy in their heyday ever have succeeded to the extent they did without each other? I suspect they would not. Who will win Tesco’s £110m advertising account? Stand by for the most hotly contested UK advertising pitch of the year – the £110m (Nielsen) Tesco account is up for grabs. But don’t hold your breath for a result. This is going to be a long-drawn-out contest, meticulously referee’d at every stage by agency intermediary Oystercatchers. Not a cosy inside job, pushed through on a nod and a wink from Tesco’s C Suite, as has tended to be the case in the past. The first stage, happening quite soon, will be the selection of 13 agencies for a credentials presentation. From these, 6 will be invited to pitch, 3 will be eliminated and the winner will emerge in, oh, July some time. If all goes according to plan. So, expect the air to be thick with speculation over the next 4 months. Let’s be clear before going any further. What’s particularly interesting about this pitch is not the fact that it is taking place now. Few readers will have failed to notice a changing of the guard at Britain’s top retailer, starting with the departure of group chief executive Sir Terry Leahy about a year ago and his replacement by Phil Clarke. Clarke is clearly a man who knows what he wants, and has wasted little time letting his senior colleagues know it too. Out went one-time rival for the top job Richard Brasher, until very recently UK CEO, after some lacklustre performance in the core operation and in came (a little earlier, as it happened) David Wood, late of Tesco Hungary, as head of UK marketing to replace Carolyn Bradley; meantime micro-managing Clarke has seized the UK helm himself. Equally evidently, Clarke has been under heavy pressure from shareholders to shake things up, pronto. 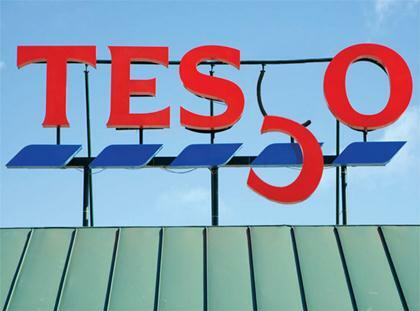 Tesco is still the UK’s biggest grocer by a wide margin, but it is a declining one. Others – practically all its leading rivals in fact – are bettering it in today’s tough market. Earlier this year, Tesco had to do the unthinkable: issue its first profit warning in 20 years, which knocked about £4.5bn off its stock market valuation in one day. Personal animosity certainly came into Brasher’s dismissal, but there is little doubt that he was a convenient scapegoat too. And maybe with good reason. Brasher’s Big Price Drop campaign was a prelude to a disastrous Tesco Christmas. Brasher also held some rather fixed views on long-term investment. Whereas, what shareholders actually want is profits now, not in some misty future. Clarke knows that a second profit warning will effectively be his corporate suicide note. So no pressure, Phil, to review your strategy. Ordinarily, UK advertising might seem to bat fairly low in a retail group CEO’s priorities – way beneath, for example, such operational issues as how many and what sort of new stores to open. Not so here, however. In giving Brasher the heave-ho and replacing the muddled duarchy at the top of UK management with a more focused leadership – himself – Clarke is also implicitly challenging Tesco’s long-established marketing tradition. Note that Brasher – like Leahy – came up the marketing route; before being promoted to UK CEO in March 2011, he had been UK marketing supremo since 2006. Clarke, on the other hand, is grounded in operations and IT, not marketing. That’s why the key word associated with this advertising review is “clarity”. Having brought more focus to UK leadership, Clarke also intends to bring more focus to Tesco’s UK marketing effort. And he’s going to do it by asking some fundamental questions about Tesco’s current positioning. Are the assumptions underlying ‘Every Little Helps’ still relevant in today’s market? How does Tesco’s current marketing strategy benchmark against that of its apparently more successful UK rivals? Has the Tesco brand become too arrogant and impersonal – through servicing the requirements of the City rather than its customers? Clarke wants ideas from his agency pitch list, not just a new colour chart. Superficially, this looks like bad news for the incumbent agency of 6 years, The Red Brick Road (or Ruby, or whatever the new digitally-enhanced business is going to be called). Although asked to repitch, it is indissolubly linked to the very marketing tradition that Clarke seems hell-bent on changing. Lineally, TRBR is descended from Lowe Howard-Spink; and the strong historic relationship forged between Lowe founder Sir Frank Lowe and Tesco top brass Leahy and his chief marketer Tim Mason. When Sir Frank split from Lowe & Partners (as it was by then called), Tesco backed his breakaway TRBR, but only on condition that Lowe creative chief Paul Weinberger was an integral part of the deal. To this day Weinberger, now chairman of TRBR, is the key mediating figure on the Tesco account (Lowe himself having retired). That said, there are plenty of good reasons why Tesco might choose to retain TRBR’s services. Second, notice that Tesco has been careful not to pull the rug entirely from under TRBR. Up for grabs is all the consumer-facing digital and traditional (ie television, press, radio and outdoor) advertising. But not, you’ll observe, trade advertising, which is a substantial part of the overall TRBR fee package. One explanation for this, no doubt, is the sheer complexity of trade marketing; but Tesco also seems to be sending a mildly positive signal to its agency of longstanding. Third, since this review is really about positioning rather than a creative makeover or a new catchline, don’t underestimate the skills of David Hackworthy and his TRBR planning department. Who else will compete for the account? Many prime candidates with suitable retail experience – BBH, DLKW/Lowe, Fallon, AMV BBDO, Rainey Kelly Campbell Rolfe/Y&R – are excluded precisely because they have conflicting supermarket accounts. However, Tesco has made it clear it will look tolerantly upon other kinds of agency conflict: for instance, a clash in financial services or telecoms. That leaves plenty of possible contenders. As my associate Stephen Foster at MAA has pointed out, Publicis London is surely one of them. Historically, it was keeper of the Asda account and is now captained by former TRBR managing director and Tesco account director Karen Buchanan. But the hot money will be on WPP. There’s some unsettled business here. Those with keen memories for this sort of thing will recall that, 7 years ago, WPP agency JWT came close to winning a big supermarket account after hiring two key Tesco agency players, Mark Cadman and Russell Lidstone, from a clearly flagging Lowe. From what I hear, WPP is putting every resource possible behind winning the Tesco trophy. Not only is JWT throwing its hat into the ring; so are Grey, Ogilvy, 24/7 Media and CHI. Though whether individually or as part of a WPP “Team” effort I don’t yet know. However, WPP agencies should tread with care. Tesco will surely be aware, or have been made aware, that there is a certain amount of bad blood between Britain’s best-known agency intermediary Oystercatchers (founded by Suki Thompson and ex-JWT new biz director Peter Cowie) and Britain’s best-known and biggest marketing services company, WPP. Namely, the Everystone breakaway affair and its litigious sequel, which came to an unhappy conclusion about a year ago. The formality of Tesco’s pitch procedure and its choice of intermediary suggests that there is no easy inside-track here for WPP chief Sir Martin Sorrell. I suspect his best course will be to keep an uncharacteristically low profile for the duration of this pitch. It’s a fitting, if back-handed, compliment to one of Britain’s leading businessmen that Tesco’s share price dropped 1.74% after the surprising news that its chief executive of 13 years, Sir Terry Leahy, will be stepping down next spring. Leahy really can claim to have inherited an edifice made of brick and left it of marble. There are many landmarks in his long reign which single him out as a pivotal figure. When he began as ceo, in 1997, Tesco was already a major high street and out-of-town player, but it was still in contention with Marks & Spencer and even Sainsbury’s. No one could say that today. When he began, Tesco made pre-tax profits of about £750m a year; today they are nearly £3.5bn. When he began, Tesco was barely an international player; now it is the third-largest retailer in the world. Clubcard was little more than a twinkle in the eye; now it is an invaluable customer database, CSR and promotional tool integral to Tesco marketing. Then, Tesco was a grocer; now it is a diversified retailer with substantial interests in financial services and consumer durables. Then, Tesco was just bricks and a few clicks; now it is one of our most successful online operators. Most of all, perhaps, we should recognise the personal dimension in all this achievement. Leahy is a self-made man who had no particular advantage in life except a Robert the Bruce determination to succeed against all odds. Even Tesco rejected him the first time he applied for a job. A natural flair for marketing was his eventual conduit to achievement. But that would have meant little in the top job had he not also demonstrated managerial skills of the highest order. This rare blend has earned him an iconic position in the marketer’s pantheon. The fact that he heads a top FTSE 100 company and that marketing has been integral to Tesco’s success remains an inspiration to people in the sector who feel that industrial culture is too driven by the bottom line and not enough by the top. Leahy has been exemplary at both skills. It’s typical of Leahy’s unobtrusive personal style that his succession arrangements should come as a surprise. And yet, they should not have done. The falling share price, ironically, misses the point about him. He will have achieved little if those arrangements crumble soon after his departure. Strong management is a culture, not a cult of the individual. The anointment of Phil Clarke as his successor emphasises the latter-day importance of non-US international expansion as Tesco’s main business driver. It’s no surprise that Tim Mason, one-time favourite to succeed Leahy, has not made the final cut. Fresh and Easy, the Californian grocery enterprise he is steering on Tesco’s behalf, has proved anything but. Note, however, that Leahy has not entirely cut him out of the will: he has been promoted to deputy chief executive. Similarly, he has attempted to bind in other strong, but disappointed, contenders – David Potts, UK retail and logistics director, and commercial director Richard Brasher – with promotion to two new roles,Tesco’s first Asian chief executive and UK chief executive respectively. For Leahy, however, it’s over. The Tesco strategy has been set: now it’s for others to implement more of the same. The manner of his departure is itself a lesson in management, often overlooked by the best. Quit while you are ahead. Curiouser and curiouser. Word reaches me that Jean-Yves Naouri – heir presumptive to the Publicis empire – is being sent to China (as opposed to Siberia). Already holding down a top job as Publicis Groupe’s operations chief, he will now be spending one week a month in the new, and additional, role of chief executive of Publicis in China. Sounds like hell on earth, but Naouri is inured to these supplementary troubleshooting roles. He has, in the past, run the group’s healthcare business and been in charge of ‘globalising’ various group functions. The signs are that he will now orchestrate the Great Leap Forward in China, where things have not been going so swimmingly as in other parts of the group. What this means for his succession prospects is anyone’s guess. Maybe it’s one more dutiful task to attend to before ascending the throne. After all, success in China would be a huge feather in his cap and put some distance between him and any other candidate. Or is he being sidelined – the favourite who has to be beaten? Success may well be the decisive criterion. I’m inescapably reminded of Tim Mason here. Mason, once marketing director of Tesco, seemed a shoo-in for Sir Terry Leahy when he steps down as ceo. I’m not so sure now. Mason appears to have bitten off more than he can chew with the indifferently performing Fresh & Easy project that he has been spearheading in California on Tesco’s behalf. It was to have been Sir Tel’s big week. Ahead of a ground-breaking speech at the London School of Economics advertising Tesco’s wholehearted commitment to green innovation, its chief executive had lined up a couple of showcase initiatives. First up is the trial of electric-car charging facilities, and shortly afterwards Tesco will announce that it is building ‘the world’s first zero-carbon store’ in Cambridgeshire. Then along comes Greenpeace and pours acid rain on Leahy’s parade with a report insinuating that Tesco, and numerous other famous brands, have been encouraging illegal destruction of the Amazon rainforest by sourcing their meat from unscrupulous ranchers who have systematically climate-raped the region. Leahy’s predicament is typical of that facing many chief executives of major brands. How do you reconcile the provision of value for money with the broader communitarian needs of your customers – and not find yourself in the dock accused of hypocrisy? The answer, if you are a progressive business leader, is that sometimes you cannot. But many judge the risk well worth taking; indeed they believe they have no real alternative but to embrace sustainability as an integral part of their corporate social responsibility programme. Despite the fact that it may consume a considerable part of their management time; and sometimes turn them, reluctantly, into figures of controversy. That’s why a number of leading UK businessmen – among them James Murdoch, Justin King of Sainsbury, Ian Cheshire of Kingfisher, and Carphone Warehouse’s Charles Dunstone – recently wrote a letter to The Times openly proclaiming their opposition to Government plans for a third runway at Heathrow. Even though the project might, in the short term, create new jobs; even though their opposition also brought them into conflict with their natural constituencies at the Confederation of British Industry and the British Chambers of Commerce. Mostly, however, espousing the cause of sustainability is a lot less controversial. Last week, for example, Cheshire helped to launch Eat Seasonably, an initiative aimed at persuading people to eat fruit and vegetables at their “seasonal best”. It’s the first leg of a two-year programme masterminded by himself and National Trust director-general Dame Fiona Reynolds which, with the backing of both Government and non-governmental organisations, will focus not simply on the food we eat, but the way we run our homes, what we throw away, what we buy and how we use transport. I asked Cheshire why he was prepared to make such a commitment to the cause. And how he found the time to do it, on top of running a FTSE 100 company. More in the column this week.